Powerplant: Six Pratt & Whitney R-4360-53 pusher-type radial engines, 3,800 horsepower each; and four General Electric J-47-GE-19 turbojets, 5,200 lbs. thrust each. Weight: Empty 158,843 lbs., Loaded 410,000 lbs., Maximum takeoff weight 410,000. Dimensions: Wingspan 230′, Length 162’1″, Height 46’9″. Performance: Maximum speed 435 MPH at 36,400 feet, Cruising speed 391 MPH, Service Ceiling 45,200 feet. The B-36 was first conceived in 1941 as a transatlantic bomber to strike Europe from bases in the United States. By 1943, the focus switched from the European Theater to the Pacific for use against the Japanese home islands. After more design changes and greater success of the B-29s, the prototype XB-36s first flight was delayed until August 8, 1946; nearly six years after initial design contracts were signed. The B-36 Peacemaker is the largest production bomber ever built. Pilots referred to it as the “Magnesium Monster”. Although the B-36 was the largest bomber ever built and held the greatest combat unrefueled radius, it never dropped a bomb in combat. A B-36J crew consisted of a pilot, copilot, two navigators, bombardier, flight engineer, radio operator, radar operator, two ECM operators and five gunners. 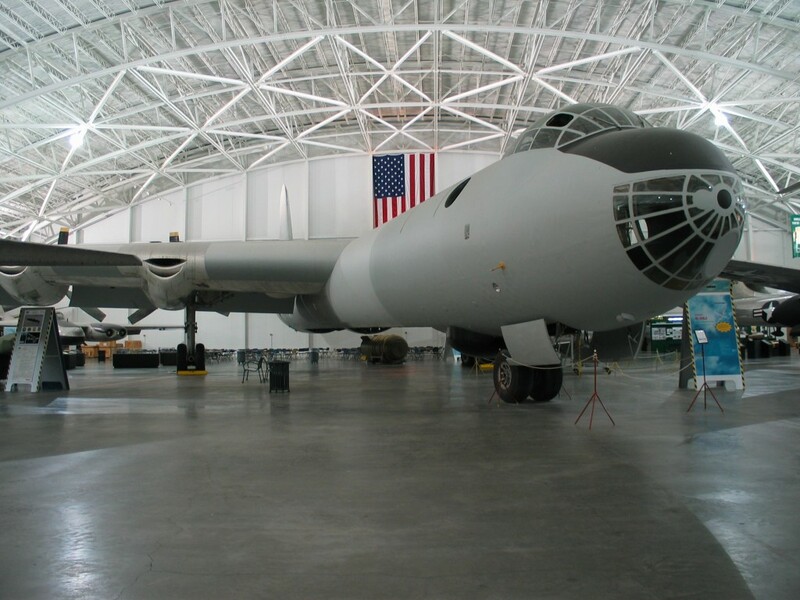 About Our B-36J-111, S/N 52-2217A : The aircraft was manufactured by the Fort Worth Division of General Dynamics Corporation and delivered to the Strategic Air Command on December 22, 1953.